I read Irene and Man Yung's tango blog with interest - and frequently amazement that they say what they do and can still dance tango! I would not have the temerity to be so blunt! however much of what they say is so true and their latest posting on territory has me thinking about the milonga tomorrow night at Concord RSL. Only when Sydney has a 5th Saturday in the month - and occasionally at Christmas is there just one milonga on for the night - it is a 5th Saturday tomorrow and so Concord is it! Last time I went I did not enjoy the music (live) or the DJ and then there was the problem with floorcraft! but this weekend Fuego Blanco (the young musicians from the SYO and the Con) will be playing so I am venturing into this territory again. Which brings me to floorcraft. This is usually a crowded dance floor and maybe it is the shape of the floor, or maybe it is just bad tango etiquette, but line of dance was a hit and miss thing at the last Concord milonga I attended. There was a great deal of swooping and helicopter-style dancing which does not work well on a crowded floor - any more than high kicking moves by tangueras do. It seems that similar bad manners is being experienced on the tango floors of Toronto as Irene describes a dancer she has labelled Little Snot Guy ( for stealing her tissues) as having fun as "He pushed the ladies in - then out. He dipped and tripped them. He flung them around, helicopter style, into other people. All in all, a one-man hazard." The photo here I took in Buenos Aires at Los Consagrados in April - crowded, but the floorcraft was impeccable - something for Sydneysiders to aim for! 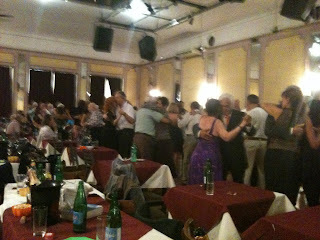 We just got home from Nuevo Chique, where--despite another tango blogger complaining that the milongas are dying in BsAs--was packed to overflowing even more than usual. As Los Consagrados always is too. And yes, the floorcraft is always excellent. But we have to remember that in BsAs in the olden, golden days, if you didn't follow the ronda you might get stabbed by someone you bumped once too often. So there is tradition here that makes dancers follow the codigos. Just like the cabeceo is not practiced much in other countries. Teachers should be more conscientious in instructing their students on the line of dance and floorcraft. Thanks for mentioning us on your blog! We're sorry to hear that the floorcraft of the milonga you attended was so awful.... Problems on the dance floor are self-perpetuating if people think that no one seems to be objecting - bad inconsiderate dancing becomes the new "norm" as it did in the case of the dance we attended. It helps to speak out to let people know it is not normal to be 1) crashing into each other willy nilly and 2) not apologizing when it happens. Sounds like Mr Snotty was having a ball at the expense of his dance partners. I love the term 'floorcraft'. Is that exclusively a tango term? The dance floors at Milonga Para Los Niños in Brisbane were, partly on purpose to get the BsAs feel, much tighter then usual, with up to 190 dancers on a floor 9 x 6.5 metres. I budgeted for 90x90cm per couple. The floorcraft was impeccable, as you can see in the videos; the dancers loved the experience. More interestingly, when viewed from above there was plenty of space for Tango. www.paralosninos.net Maybe it has something to do with the music played and the atmosphere created, or peoples' expectations. However, my observation is that a milonga "floor" is usually disrupted by only one or two thoughtless or ignorant couples.